All apple growing regions but especially arid or semi-arid climates. Susceptible varieties include Jonathan, Delicious, Stayman, Winesap, Granny Smith and Fuji. Water core is associated with high maturity fruit. Low night temperatures in fall hasten maturity and promote watercore development. Watercore is promoted by large fruit, high leaf to fruit ratio, high fruit nitrogen and boron, low fruit calcium, excessive thinning, high light exposure, Ethrel sprays, and girdling of trunks and limbs. Another type of watercore which is unrelated to maturity may occur during unusually hot weather. This watercore is found more on the exposed side of the apple and may be associated with sunscald. Can be difficult to detect externally unless symptoms are very severe. If moderate to severe, results in reduced storage life of the apple as internal breakdown develops in affected areas. Affected fruit must be marketed rapidly. Incidence varies season to season but incidence can be very high. A preharvest disorder resulting in water soaked regions in the flesh, hard and glassy in appearance, only visible externally when very severe. 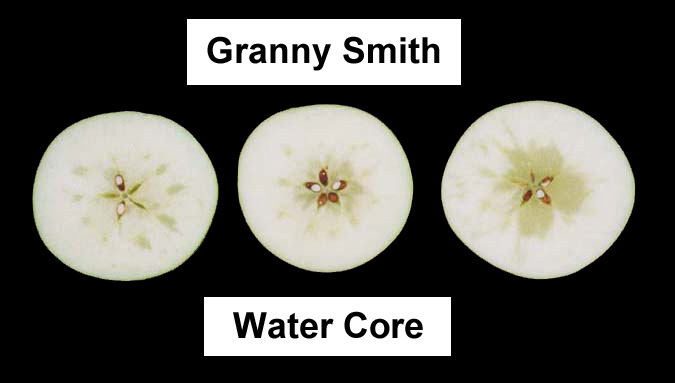 Water soaked areas are found near the core and around the primary vascular bundles but may occur in any part of the apple or involve the entire apple. Symptoms often increase rapidly as fruit become overmature but does not increase postharvest. If symptoms are mild to moderate, they may disappear completely in storage. However, when watercore is severe, internal breakdown can develop. The water soaked appearance of watercore affected fruit results from the accumulation of sorbitol-rich solutions in the intercellular spaces. Sorbitol is the carbohydrate source translocated into the fruit from the tree. Sorbitol must be converted to fructose by the apple fruit. The reason for accumulation in the intercellular spaces is not known. It is speculated that sorbitol may be translocated to the fruit faster than it can be assimilated perhaps due to an inability of the apple tissue to convert sorbitol to fructose. Comparative studies have shown differences in vascular tissues between susceptible and resistant varieties. The browning and breakdown that results from severe watercore is likely due to reduced gas diffusion in the affected tissue and may involve an accumulation of ethanol and acetaldehyde. The most effective way to reduce the incidence of water core is to avoid delayed harvests. As fruit approach harvest maturity, samples of fruit from the southwest quadrant of the tree should be cut to look for water core. Fruit should be harvested before water core develops extensively. A subsample of fruit at harvest should be cut prior to storage. Lots with moderate to severe water core should not be placed in CA storage but should be marketed quickly.